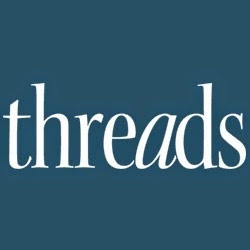 During the 2015 American Sewing Expo (ASE), we caught up with Threads author Ruth Ciemnoczolowski. 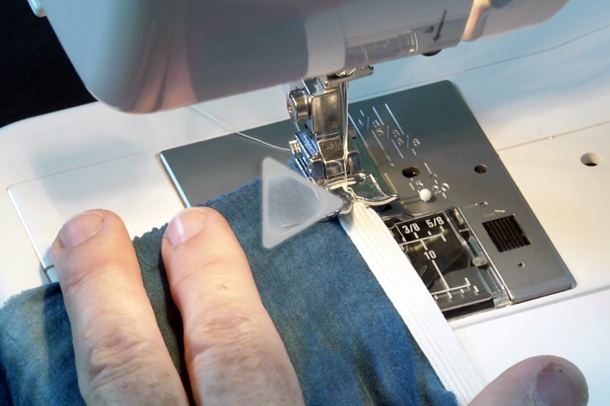 In this short video tutorial, Ruth demonstrates a quick and easy technique for threading a needle. This method prevents the thread from twisting, which allows for smoother hand sewing. She also offers a handy tip for conditioning thread. Looking forward to your upcoming videos. Thanks for the info about the lip balm. Most useful.I note that Ruth threads the needle by taking the thread to the needle not the needle to the thread. Taking the needle to the thread will work much better especially with a small eyed needle and basting thread. A tip given to me by a professional tailor. Waiting for working with multiple threads and strengthening your hand-sewing !!! Umm, the direction of twist doesn't change if you turn the thread around. You can easily see this if you look at a loop of rope where two segments are parallel even though they are connected by a U turn. Sometimes people describe threads or yarns as having a Z versus S twist. It doesn't matter which direction you come from. There might be another reason why it's better to thread the needle as it comes off the spool, but it isn't this. I don't mean to offend anybody but it seems somebody should point it out. I am sure other hand spinners have already told you that it doesn't matter from which end of the thread you thread your needle. A thread is spun in either what we call a "z" or an "s" twist. The single fibres will usually be pun in one direction and then plied in the other direction. You can take it from either direction, but the twist remains constant. I have had a subscription for many years now and have given subscriptions as gifts. I love your magazine and have learned a great deal through it. My grandmother taught me this way of threading a needle,too and the reason has nothing to do with the S or Z twist. It has to do with the curl the thread takes from being wound on the spool. Like setting your hair in curlers. It also helps if you anchor the end of your thread to the spool before you cut it off. I try to mark the 'slot' on some reels with a permanent marker when I first get it; saves searching for the slot when it is nigh invisible. Other reels have a end which pushes into the main spook; slightly 'cogged' it acts as a handy holder for the end of your thread. Some threads are just not cooperative. It may sound gross but one trick that seems to work is to wet your finger and wet the eye of the needle. (it's your spit and your needle - who cares!) It seems to pull the thread into the eye. Works for sewing machine needles, too. Of course, we all know that it works better to cut the thread at an angle in the first place. Happy sewing!!! Although I did enjoy the part where you shared your tips on threading a needle and using lip balm to strengthen the thread, I believe the part I'll remember most from this video is when you talked about how teaching others to sew creates wonderful memories for them. Your mother and grandmother will always be alive to you through this art that they taught you. Those of us who love to sew should share our love of sewing with others so the art will live on after we are gone. Was it necessary to get to 27 before I was given this knowledge?! Thank you, Ruth, your grandmother must've been a very experienced and wise woman!! Thanks for your tip about not cutting the tread before you thread the needle. I also was taught this by my mother, additionally she said that when you are older and your sight is not as good you won't loose the thread. I didn't understand this as a child but I certainly do now! So we have the thread through the needle but no mention of which end to knot? I am assuming she would knot the end toward the spool? So very interesting. Now I know why I have had problems. It only took 60 years for me to learn the correct way to thread a needle. Now I need to remember it. Wetting the eye of the needle helps in threading due to the capillary action of the water. It sort of "pulls" the thread through for you. Unless you are using multiple strands (embroidery floss) and a large eye, wetting the thread can make the end of the thread fatter as it swells with moisture, making it harder to get it through the eye of the needle. I have recently learned, though I forget the source, that the eyes of needles are stamped out with a machine. 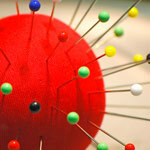 If you are having trouble getting the thread through, turn the needle over and try again. I am a novice sewist. These little tidbits have helped me a lot! As Mulligatawny and LaurieEm have pointed out, twist direction is the same, regardless of which end is up. I believe this is referred to as helical symmetry (also seen in springs, Slinkys, and screw threads). However, in both hand- and commercial spinning, the movement of the strand through the spinner's hands or the machinery creates a "nap". The surface of the thread/yarn will feel smoother in one direction than the other.